Shurtliff turns the Rumpelstiltskin tale on end, providing the heartbreaking yet humorous history of the manikin’s dilemma. When he is born, his mother only manages to say part of his name before she passes: “Rump.” His name becomes the source of teasing, and while Rump can appreciate the humor—sometimes—he is concerned. His name is his destiny; how can he grow when he does not know his full name? To his surprise, Rump also discovers he can spin straw into gold—a curse, since when Rump trades the gold, he must accept whatever is offered. 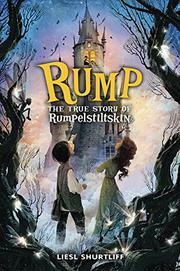 Using a crisp, cheeky tone and with the back story meticulously built, the landscape mapped out and the characters in place (including some nods to other fairy-tale denizens), Rump’s romp begins. The miller is greedy and worsens the situation when he tells the king that it is his daughter who spins gold. Rump tries to save her, but she is frustratingly fatuous and makes terrible trades (a baby!). Witches do not offer much advice, other than “Watch your step.” When Rump learns that he must find a “stiltskin” to break the curse, it may also be the clue he needs to figure out his name. In his moment of triumph, children will want to dance alongside the unlikely, likable hero.